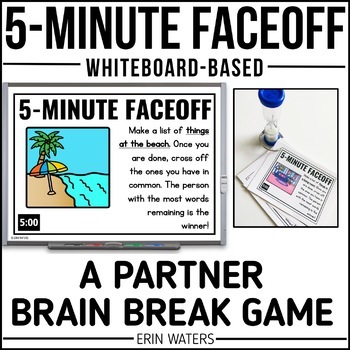 5-Minute Faceoff is a quick, simple, brain break alternative that involves partners, creative thinking, writing practice, and FUN---but also, is a NO PREP and PAPERLESS option for today’s busy teacher. 3. In the 5 minutes given by the timer on the slide, each student writes as many words on his board as he can think of. 4. Once the timer is finished, partners compare answers. Each similar answer is crossed off, and each unique answer earns a student 1 point. 5. The player with the most points is the winner! • “Hidden” Learning: Students practice foundational skills like stretching out words, thinking in categories, sorting information—all while “playing”! •Building Sportsmanship: Students exercise teamwork and sportsmanship skills as they learn to navigate winning and losing graciously with a partner or group. Tell Me More About the Prompts! This pack includes 180 unique prompts*. 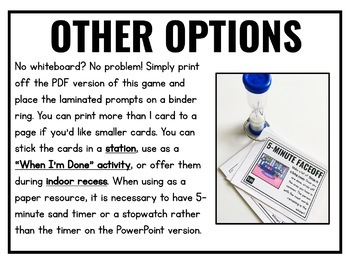 The slides can be viewed on a whiteboard using PowerPoint OR the slides can be printed and placed in a station or used for a “When I’m Done” activity. Please note that if the slides are printed, you will need to provide a timing device (sand timers work well!) for students to use in that station. 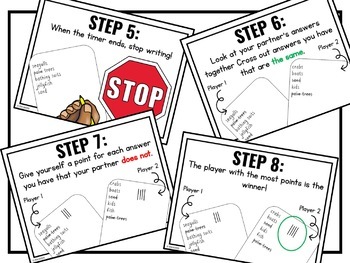 *The prompts are designed to be appropriate for most K-3 classrooms; 90 of the slides are “just for fun” category slides while the other 90 slides focus on a wide range of phonics, math skills, etc. (for example: make a list of words that rhyme with ‘cot.’). Some of the skills targeted might be new to younger students earlier in the year and they may also be review for older students; however, the majority of slides will appeal to a wide range of ages. 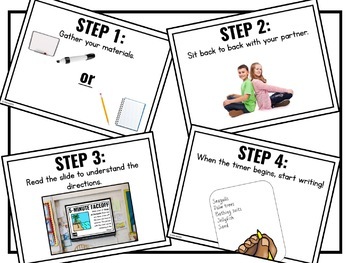 Slides that are “easier” or “harder” for a group of students can be used effectively in guided math or reading groups as well!